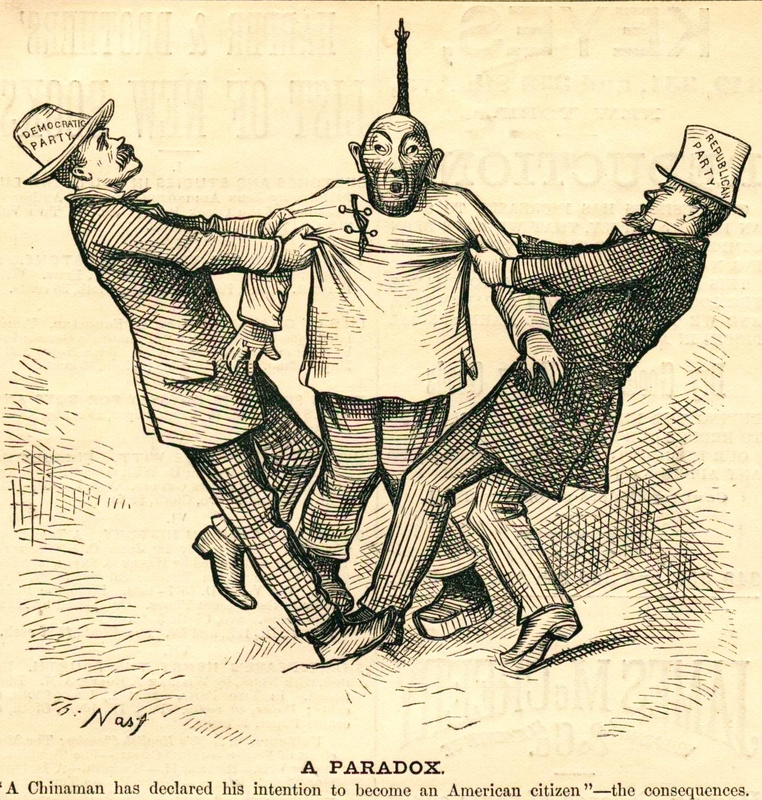 This smaller cartoon is a commentary offered on the eve of the passage of the Chinese Exclusion Act, signed into law on May 6, 1882, by President Chester A. Arthur. The passage of the act was a victory for the Democratic Party, shown here, not as a donkey, which had become the favored symbol. Instead, Nast returns to his past and revives his old nemesis, the Tammany Tiger. The Tammany Tiger clenches on the queue of a Chinese man who is desperately holding on for life by wrapping his arms and legs around a tree trunk named “A Veto.” The weight of the tiger is pulling down on the queue, stretching the Chinese man and causing him great discomfort. The queue is the lifeline for the tiger. The Democrats are reinvigorated by raising “The Chinese Question” and their legislative triumph to drive the Chinese out. By referring to the Democrats as the Tammany Tiger, Nast makes an unmistakable comparison to the corrupt Tweed era. At last, this tiger has found something to hold onto. In a twist of irony, the Chinese, by their very existence, have empowered the Democrats. Democrats had been on the wrong side of slavery, and the losing side in the Civil War. By exploiting racial fears, Democrats, with a strong Irish constituency, found a receptive audience by stoking Sinophobia in communities where a visible Chinese presence could be targeted. Repeatedly and effectively, the Democrats pointed to Chinese “otherness” to swell their ranks and influence of political power. “The Chinese Must Go” made famous by Irish-born Denis Kearney in California, soon became a roaring anthem across the nation. 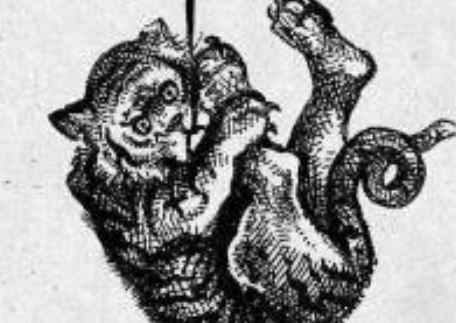 The Tammany Tiger can hardly believe his predicament. After Tweed’s arrest and fall from power, the tiger had been quiet. The tiger has only barely escaped doom. He holds the queue precariously by his teeth. His limbs are all askew, and he has an expression of surprise or puzzlement. 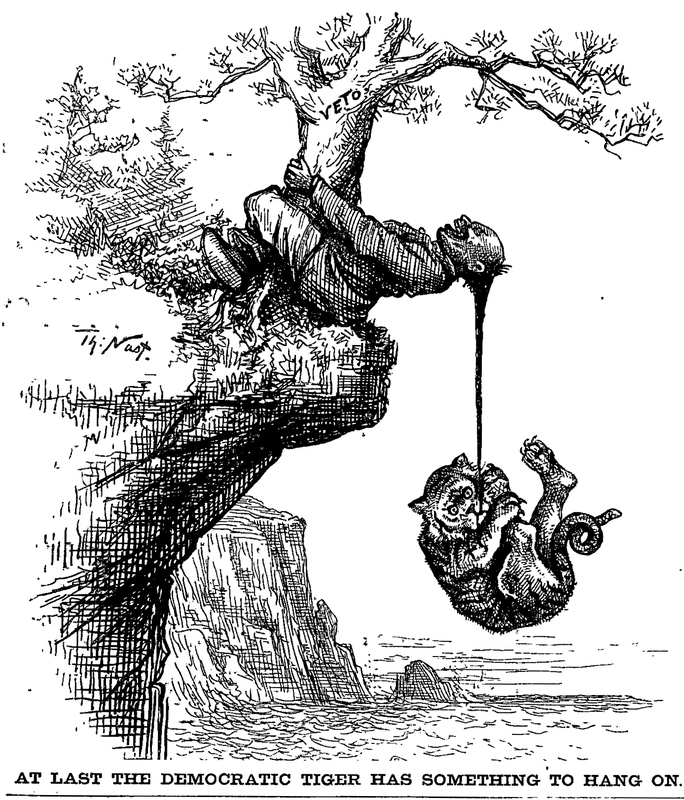 Thomas Nast signed the cartoon on the left side or side of the Chinese trying to remain in the U.S.